When asked what his favourite food is, Patrick, our Head Chef, will say “French” with very little hesitation. French food is to Patrick, what lentils are to the French. 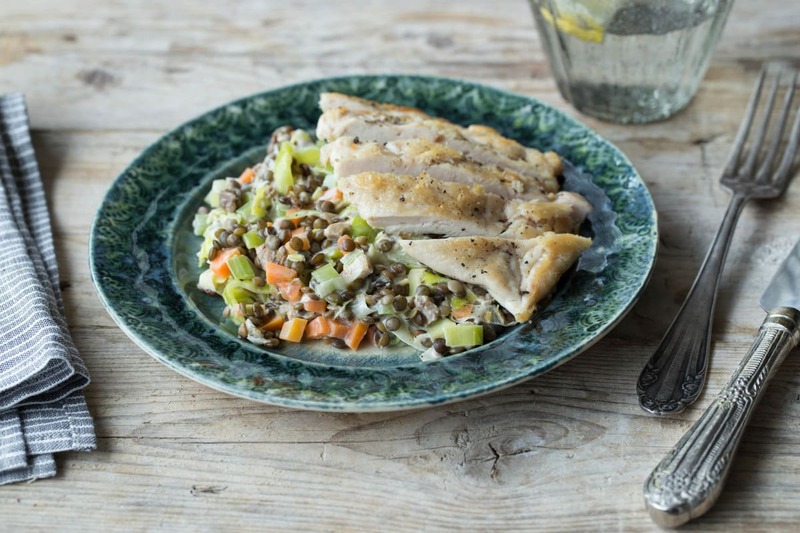 Known as the poor man’s caviar, the humble green lentil is an exalted ingredient in French cooking, with a texture superior to that of any other lentil variety. It has a delicious nutty flavour with a moreish smooth interior and nutritional credentials to knock your socks off. It’s also a cousin to the pea. Enjoy! 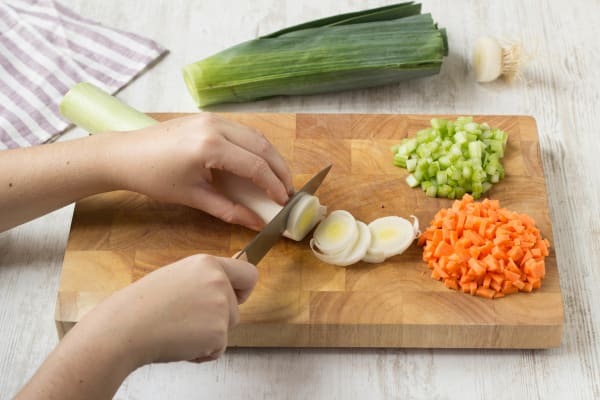 Peel and finely chop the carrot into tiny cubes (less than ½cm cubes if possible). Chop the celery into tiny cubes too. Chop the very bottom and the leafy top from the leek. Slice the leek into ½cm discs. Finely chop as much chilli as you dare. Pinch the thyme stalks between your thumb and index finger and run your fingers along the stalk to strip off the leaves. Remove the sage leaves from their stems and roughly chop. Heat a splash of olive oil in a frying pan on medium heat. Add the carrot, celery, leek, chilli, thyme and sage to the pan. Add a good pinch of salt and cook gently for around 8 mins until soft. Tip: Turn the heat down if the ingredients start to brown off. 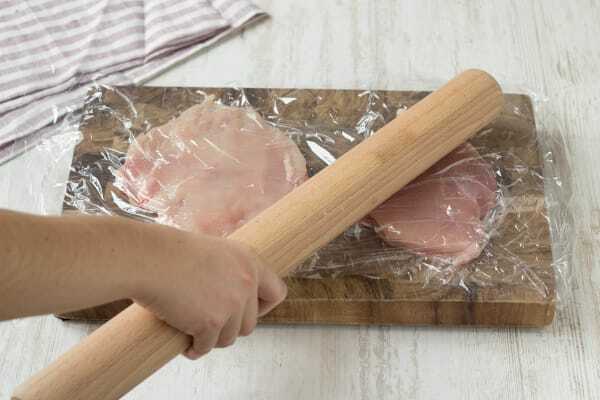 Place each chicken breast between two sheets of clingfilm. Use a rolling pin or the bottom of a saucepan to whack the chicken. Tip: You want the chicken to be less than 1cm thick all over. Heat a splash of olive oil in another non-stick frying pan on medium-high heat. Once hot, add in your chicken, skin-side down and cook for around 4 mins on each side. Season both sides with a pinch of salt and black pepper whilst cooking. Tip: The chicken is ready when it is no longer pink in the middle. Thoroughly rinse and drain the lentils. 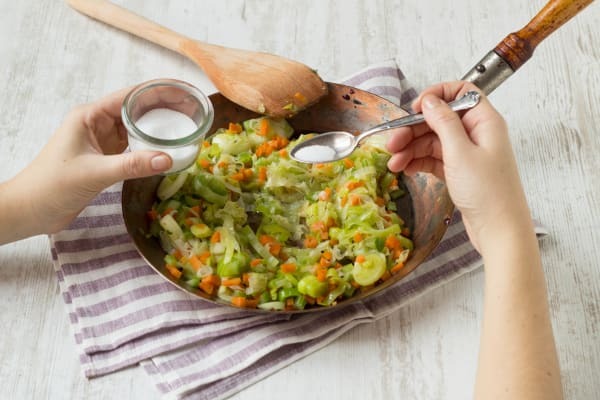 Add them to your pan of vegetables with a splash of water, the chicken stock pot and the crème fraîche. Add a pinch of salt and a few grinds of black pepper (taste and add more if needed). Cook for a minute or two until everything is warm. 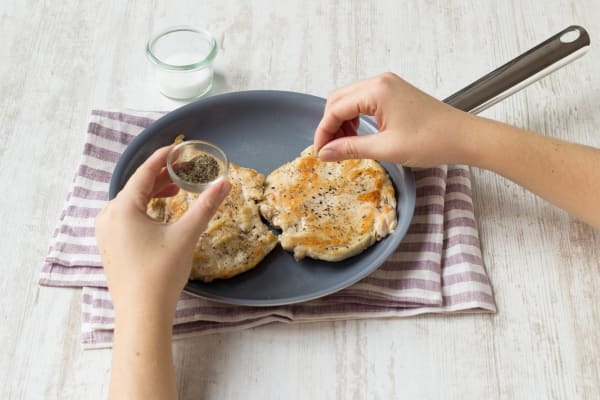 Spoon the mixture onto plates and top with your cooked chicken.